After giving up a hectic life as a journalist in Europe and Hollywood in the late 1960s to return to his boyhood love of nature, Mike Tomkies found Eilean Shona, a remote island 'between earth and paradise' off the west coast of Scotland. There he rebuilt a rotting wooden crofthouse which sheep had used for shelter from the bitter Atlantic winds and began a new way of life, observing nature, that was to last to the present day. He tracked wildlife, stags, foxes, made friends with the seals, and taught a young injured sparrowhawk to hunt for itself. It was the indomitable spirit of this tiny hawk that taught Tomkies what it takes for any of us to be truly free. Whether he was fishing, growing his own food or battling through stormy seas in a small boat, he learned that he could survive in the harsh environment. This book, the beginning of a remarkable Scottish odyssey, has long been out of print until now - but one which has long been demanded by Tomkies' loyal readers. Between Earth and Paradise tells of an astonishing story - of daring to take the first step away from urban routines, which many of us only dream about - which led in turn to an even more remote location and his unrivalled series of books on the golden eagle, the wildcats he reared, and his faithful dog, Moobli. This will be of immense interest, not only to Mike Tomkies' fans, but also to anyone with an interest in wildlife, the natural world and those with an interest in living self-sufficiently. 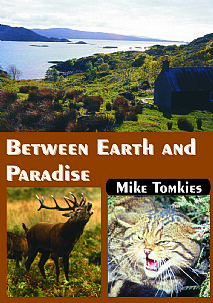 Between Earth and Paradise is also an engrossing story which will transport the reader to share Mike's lonely but rewarding lifestyle.